What are the differences between Debt Management Plans and Debt Reduction Plans? A Debt Management Plan helps people to consolidate (combine) their unsecured debt into one payment; whereas a Debt Reduction Plan helps people to reduce the total amount of debt owed. The reduced debt can also be consolidated into one single payment. A Debt Reduction Plan is used when an individual is unable to repay the entirety of their unsecured debt. A Debt Management Plan is your first option in the debt consolidation process. This involves building a plan to consolidate all of your debt into one monthly payment – saving you interest due to the Creditors reducing your interest rate down to 0% in most cases. Our experts take a look at your finances and determine a payment that is comfortable. You make one monthly payment that will satisfy all your creditors, and get you out of debt within 5 years. You do not have to declare bankruptcy and your credit score is not affected to the level of other debt repayment or elimination options. If we are unable to build a payment that is not going to cause hardship or put strain on your day-to-day living then a debt reduction plan may be necessary. A reduction of the total debt owed will help to bring the total monthly payment into a level that is manageable with your budget without having to declare Bankruptcy. If a Debt Management Plan is not going to work for your situation do not worry! A Debt Reduction Plan is your second option in the world of debt restructuring. Debt Reduction Plans reduce the total amount owed to the various lenders and creditors – sometimes by as much as 70%. The debt is reduced to a level that can be payed off in a five year period by making the maximum monthly payments your budget will allow. This will also not affect your credit as much as declaring bankruptcy. You will recover faster and become debt free within 5 years! Stop stressing about your finances, we can help! 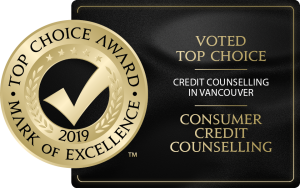 With Consumer Credit Counselling you can become debt free faster than you ever thought possible all while living within your current budget. Contact us today for a FREE Consultation or click HERE to fill in our online Budget Worksheet and to see if you qualify. See more of our Frequently Asked Questions.